2018’s Top Trends for Fall/Winter Weddings - RiverCrest Weddings - Montgomery County, Chester County & Philadelphia's premier wedding venue. Every year, a new crop of wedding trends pops up. And while many couples try to steer clear of anything too “trendy” — hey, nobody wants to have a wedding that will look dated in a decade — there are still plenty of ways to make your big day feel of-the-moment. Here are the wedding trends taking over for fall and winter weddings this year, from elegant capes to hand-painted cakes. Work one, two — or all! — into your wedding day for a celebration that feels both timely and timeless. In 2018, brides are swapping pastel palettes for deeper, more dramatic tones like burgundy, forest green and amethyst. This wedding trend can be carried over to your bridal party, too: Tuxedos and bridesmaid dresses in midnight blue or navy are also having a moment. Rethink the traditional seating card set-up and get creative! Stick guest seating arrangements in a small cocktail or glass of champagne to get the party started. Or, for a chilly mid-winter event, put the card atop a stick of marshmallows and tuck it into a small mug of hot chocolate. (Go here for gorgeous inspiration!) Cheers! Boho décor and barn weddings have ruled the wedding scene recently, but formal affairs are stealing back the spotlight. Think: elegant ballrooms (may we suggest RiverCrest? ), traditional tuxes and sophisticated florals. The RiverCrest ballroom is ready to host your elegant fall or winter wedding. 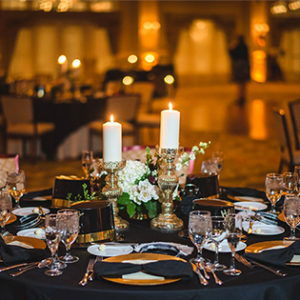 Yes, you can incorporate black accents into your wedding without it looking somber. Consider an invitation suite with hints of black, black chargers, or a cluster of black taper candles, all of which tie in well with a moody color scheme. Hesitant to embrace the dark side? Do it in small doses, like incorporating white anemones into your bridal bouquet; the almost-black center of the flower provides just enough contrast. Calling all cold-weather brides! This year, bridal style was particularly focused on covered-up silhouettes, with designers showcasing gorgeous bridal gowns with sleeves, laser-cut capelets, and plenty of elegant capes.